You guyyyyyyyys. Huge Star Wars news!!!! It hasn’t even been two months since Star Wars: The Force Awakens was released, but the first teaser for the brand new Star Wars movie has hit our computer screens. Star Wars: Episode VIII has started filming and the official Star Wars website released a teaser trailer AND announced the movie’s new cast. So basically this week is off to a pretty great start for Star Wars fans. 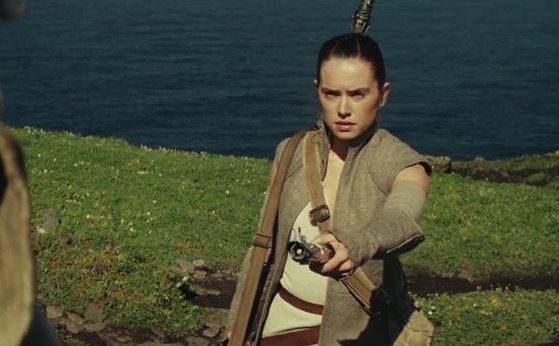 The trailer picks up exactly where Star Wars: The Force Awakens left off. Mark Hamill, Carrie Fisher, Adam Driver, Daisy Ridley, John Boyega, Oscar Isaac, Lupita Nyong’o, Domhnall Gleeson, Anthony Daniels, Gwendoline Christie, and Andy Serkis will all be returning for the next chapter, and Benicio Del Toro, Laura Dern and Kelly Marie Tran will be joining them. We’re trying to be chill about all this news, but it’s not easy. Because LAURA DERN!! Star Wars: Episode VIII, which is being directed by Rian Johnson, is scheduled to be released December 15, 2017. If your calendar goes all the way to the end of 2017, mark it. If not, mark your minds because the count down has officially begun!